The first and only series with real drum heads were the hexaheads (not counting the Premier pads that came with the early SDS 3 and 4). The hexaheads were coated with non-standard 11" heads made exclusively by Evans (as far as I know Remo didn't offer 11" heads at that time). Under the head there are two foam layers with a metal plate between just like a sandwhich. The trigger mic sticks under the metal plate. The snarepad has a separate rim trigger mic. Both triggers, snare and rim, can be balanced by a fader on the front panel of the pad. 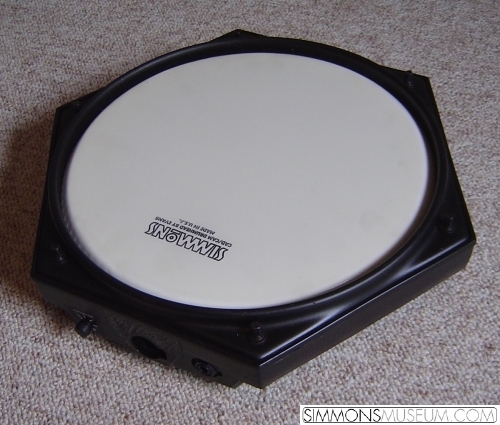 Similar to the snare pad, the bassdrum pad offers two triggers as well which are fader balanced. The second trigger is under the handle on top of the pad. The hexahead series didn't offer special cymbal pads although the flyers had shown the minihex pads as some kind of cymbals in the displayed setups. In fact I cannot imagine hitting these little thingsproperly in a live situation.